Sitting down to an elegant dinner in tie and tails are a room full of distinguished men each seeming bent on out-shining the next in terms of breeding and class. As one reaches across the table to retrieve the dish of butter, his arm hits the salt cellar, which wobbles once or twice, and then falls. The crystals of salt have barely scattered on to the silk table cloth when the gentleman reaches forward, picks up a few grains in a pinch, and then tosses them over his left shoulder. This display of the superstitions about spilling salt passes uncommented upon as the dinner continues. It is considered bad luck to spill salt, but the superstition most associated with this activity is not the act of spilling, but what comes next. In order to prevent the bad luck from settling on the salt spiller, the person who did the pilling is required to toss some of the spilled salt over his left shoulder. This very specific action is supposed to act as a shield, but must be done immediately for its benefits to take hold. This very interesting superstition has been around for a very long time, although its exact origins are obscured in history. The origins of the spilling salt superstitions may lie in the fact that spilling salt was considered bad form long before it was considered bad luck. In ancient times salt was an expensive commodity, and one that had many useful purposes. 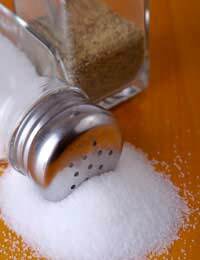 Wasting salt, therefore, was frowned upon, and so some suggest that the admonition of spilling salt being “bad luck” came about as a way to stop the careless from wasting a precious spice. But what of throwing the salt over the shoulder- and why the left shoulder so specifically? In some Christian beliefs the Devil hangs about over the left (also known as the Sinister) side of the body, looking for an opportunity to invade. Spilling salt, seen as an invitation for the Devil to do his handy work, needs to be accounted for- tossing said salt over the left shoulder puts it square in the devil’s face, just as he is on the attack. There is another Christian origin that some ascribe to the superstition that spilling salt is bad luck. Like the Holy Grail myth and the superstition about the number 13, the idea that spilling salt can bring you ill is linked to the Last Supper. The famous painting by Da Vinci shows the betrayer Judas having just knocked over a salt vessel, spilling the spice all over the table. Salt is common enough today that spilling a bit isn’t considered a major crime, nor is it common to see the spillers ducking and weaving to avoid an oncoming attack by evil spirits lurking over their shoulder. However, whether in jest or as a nod to the beliefs of their elders, you may see even some of the very young take a pinch of salt and toss it over their left shoulder before continuing with their meal. Last night after i ate.I was walking towards the stove to put the salt shaker away and it felt as if something hit my hand and the whole salt jar fell and broke. I swept it all up and rince it under hot water , but is it bad luck or will i have bad luck. That was a lot of salt that fell. Has me kinda. Worried ?? @Dark.demon.queen - it does, fill a bowl with salt and place it in a room to absorb all negative energy. Don't even remember where I learned this but I've been superstitious about salt since I can remember. Something about salt intrigues me....not sure what but I feel like it has some ancient power. Very interesting ! It is also bad luck to break a mirror as it is quite complex in its atomical structure! And atoms don't particularly like it,especially if it is curved! The colour of every mirror is green! As that is because green is the only colour it absorbs! This is only noticeable when standing in front of one with one placed behind creating the "Hallway effect"! And will always veer off to the right as it trails away! This I believe is because atoms can be lazy as well as knowing that to create an infinate definition is beyond our comprehension as well as unnecessary! It is also believed by many,including myself ! that when a mirror is broken, the atoms become confused about which direction to go,and are thrown into an eternal state of negative suspended animation! So, that's pretty bad luck for the atoms involved and for you as you are made of roughly 1 billion,billion,billion of them! And just like you and me,"there's only so much sh#t they'll take before they protest and your life begins an unstoppable course towards the Galaxy known as ""proper pear shape" or colloquially as "t#ts up". "Please feel free to respond and enlighten me". Thank you . Thank you this anwered my question, and was very interesting.